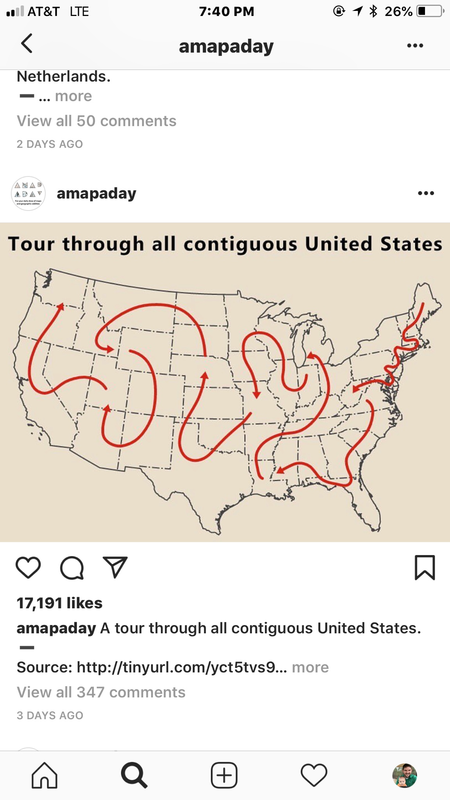 I follow a profile on Instagram called amapaday and I saw this a few weeks ago. It shows a path connecting all lower 48 states, though not overlaid on a roadmap. There are a couple of states doubled (Oklahoma sees the line twice, and Virginia does twice, maybe 3). I’ve tried to write out what routes this line would actually follow. See what you think and what edits you might make. Note, I didn’t choose what was the fastest route or the most logical but I tried to see what routes the red line actually followed. Usually I chose what route looked closest to where the line made border crossings or whether it seemed to travel trough the center of a state. I found that in the East there were sometimes multiple options while in the West there was often only one route that would work. I named major or regional cities for most states. Well, there's a zillion ways to hit the lower 48. There's a few maps out there showing what is probably the fastest way. I've long wondered what's a good way to maximize a visit to each state; most 48-state road trips maps tend to give a few states a quick clip and move on (Florida and Maine, for example). But how much is enough...200-300 miles? And is that feasible in Delaware or Rhode Island without a lot of backtracking? It looks like the vague squiggles tried to accommodate that ideal, but there's a few northeastern states that aren't going to get equal treatment. There are a couple of states doubled (Oklahoma sees the line twice, and Virginia does twice, maybe 3). Well, the line enters Virginia from West Virginia, but it doesn't necessarily go through Virginia prior to that. You can, and in this case probably would, drive directly from Maryland into West Virginia. In fact, you can do so entirely on the interstate system. Not sure where you thought the third one was (are you including DC? ), but I'm only counting one pass through Virginia, considering the above. ^ Given that they draw the line through the eastern WV panhandle (a path that is not possible via Interstate, as I-68 stays within Maryland until Maryland's westernmost extent), a logical path of follow would be I-270 to Frederick then US 340 into WV. 340 cuts into Virginia for about a mile along that path, so that would certainly make for a 2nd pass through Virginia. Staying on 340 to VA 7 to Winchester then west on 50 yields a third pass. I think you're being a bit too literal here. The "paths" shown are very broad lines and arrows that very roughly approximate routes in the real world. It actually looks possible to enter all 48 states without backtracking through already-visited states. The OK problem can be fixed by going straight from MS into TN the first time. Then when you come back south into MO, you go through AR and LA to get to TX. If you count DC, that map shows a MD duplication. That can be fixed be going straight from MD through DC into VA, and then cutting back through WV to get between KY and OH. It technically looks like the line goes through VA's northern extremities on the way from MD to WV; but then the line is basically thicker than Maryland's panhandle in some spots anyways. The point is that it's very easy, even preferable, to continue in MD all the way to WV and avoid making a second pass through Virginia. Whether or not that is one's objective is another matter, but I assume the premise is that double-entries are to be avoided where possible, hence my earlier comment. I was also trying to follow the spirit of the OP.